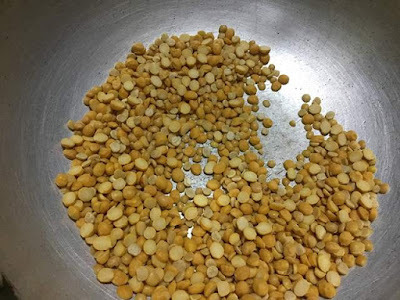 Sambar powder - perfect homemade sambar powder with few basic ingredients in your kitchen. 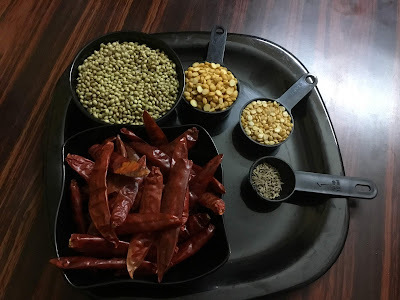 My mom is an expert in preparing homemade spice powders for kuzhambu varieties. This is also my mom's recipe. 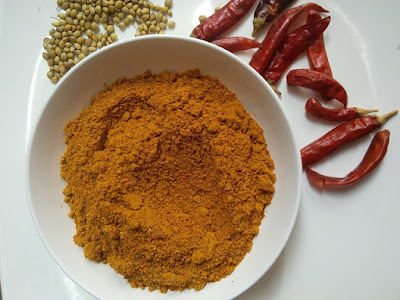 My mom taught me that fresh ingredients are all you need to make a good sambar powder. Plus, roasting the spices right before powdering gives the sambar powder more flavour. So always try to use fresh spices for sambar powder. Sambar powder tastes good with the perfect blend of spices. For this measurement, you will get around 250 grams of sambar powder which will be good for 2 to 3 months. 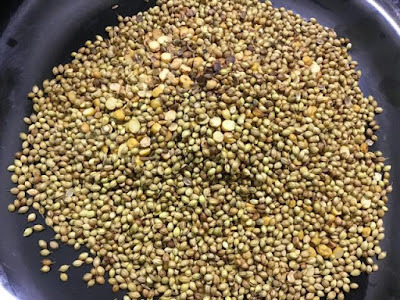 The first thing about making sambar powder I learned was this : the dals and coriander seeds need to be roasted in the correct heat until you can smell a nice aroma from it. Excess roasted chana dal and coriander seeds will change the taste also. If the spices are not roasted well, then there will be no flavour in the sambar powder. The next important thing is roasting the dried chillies. We have to roast the chillies with a drop of oil for a second and then turn off the heat. 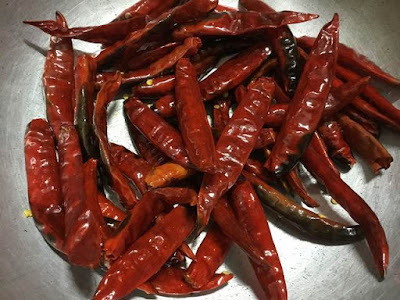 Do not roast the chillies until it turns black because you will lose the beautiful red colour when powdering. After the roasting methods, making the powder is pretty easy. The grinding takes a few steps which will be finished within 10 minutes. 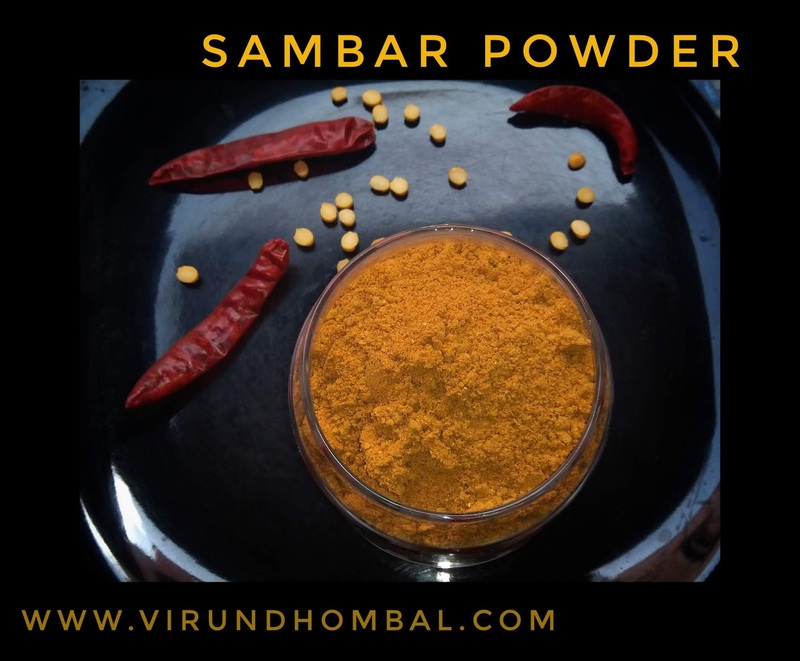 Grinding your own sambar powder is satisfying and you will get a healthy product without any artificial colours and preservatives. Now we will see the recipe in detail. Heat a medium heavy pan and add the chana dal. Keep on stirring for a few minutes and add the toor dal. Roast the dals until it turns golden brown in colour. Next, add the coriander seeds. Stir often and roast. When they become fragrant and change in colour add the cumin and roast it for one more minute. Then remove from the pan and add it to the plate. Now heat 1/4 tsp gingely oil and add the dried red chillies. 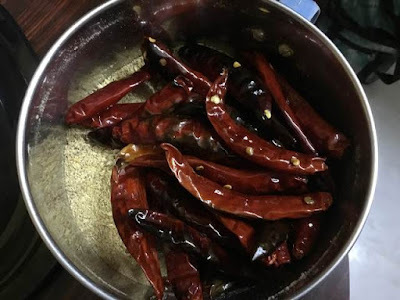 Roast the red chillies for a second, till they turn dark red colour with little black spots or crisp. Turn off the heat and keep it in the heat itself. Cool the roasted ingredients to room temperature. 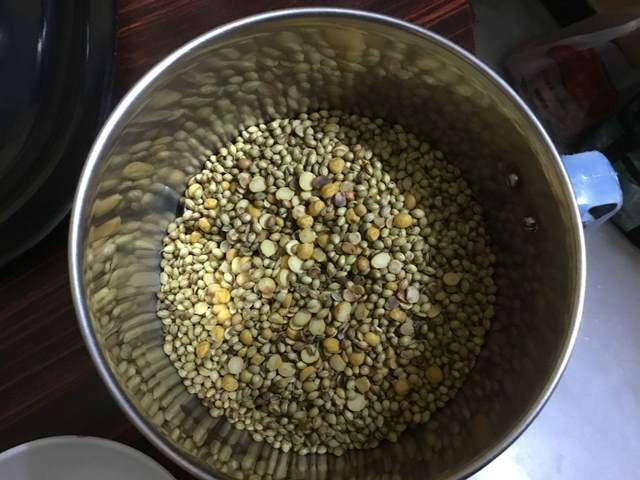 Then, using the big mixer jar to grind the roasted dals, coriander seeds and jeera. After crushing them a little add the roasted red chillies. Grind it to a fine powder. Measure and keep all the ingredients ready for roasting. Heat a medium heavy pan and add the chana dal. Keep on stirring for a few minutes and add the toor dal. Roast the dals until it turns golden brown in colour. ( Do not fry them until it turns black). 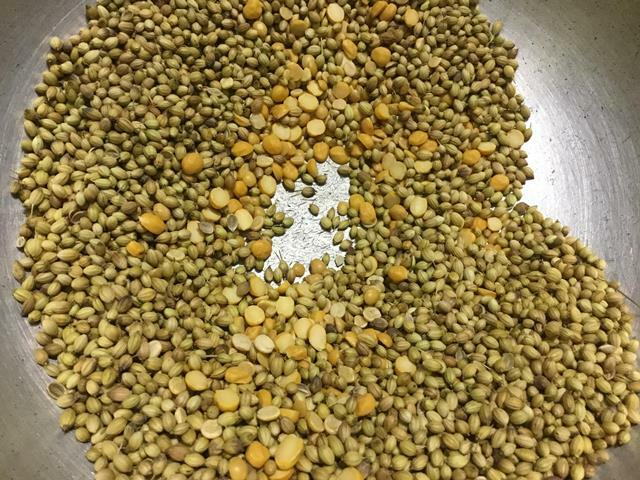 Next, add the coriander seeds. Stir often and roast it well. When they become fragrant and change in colour add the cumin and roast it for one more minute. Then remove from the pan and add it to the plate. Cool the roasted ingredients to room temperature. 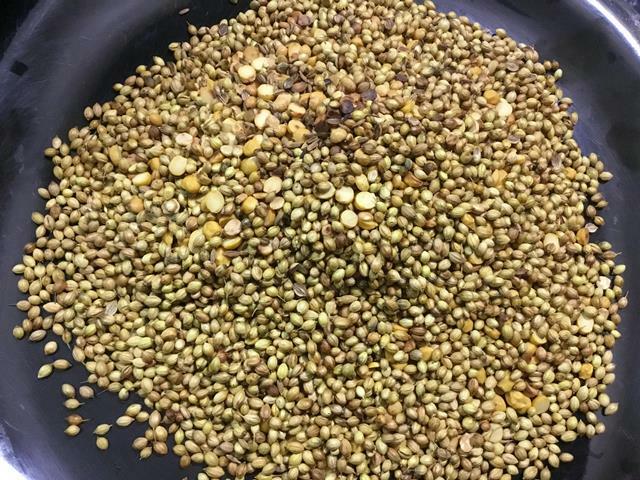 Then using the big mixer jar grind the roasted dals, coriander seeds and jeera. After crushing them a little add the roasted red chillies. Grind it to a fine powder. If you want to add turmeric powder, add it now and grind it once again until everything is combined well. Allow it to cool down and then transfer it to an airtight container. 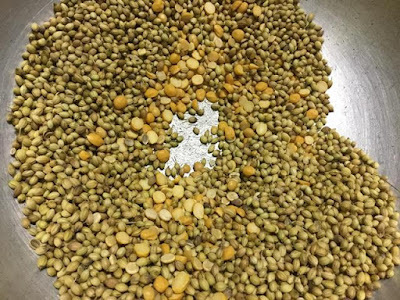 When you prepare sambar with 1/4 cup of toor dal add 2.5 tbsp of this sambar powder. 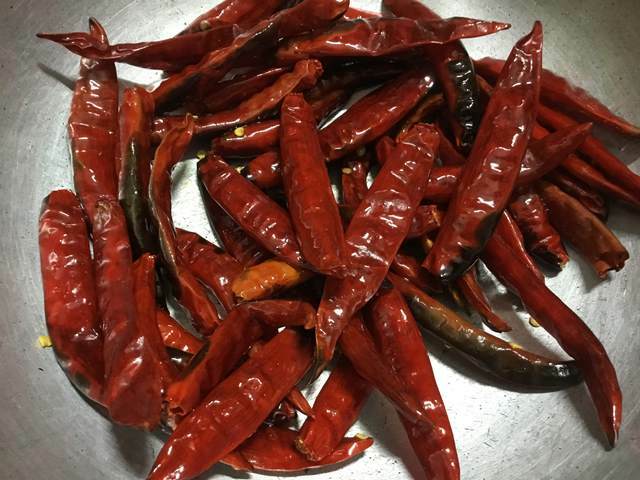 If you want more hot, add more red chillies. In the final stage, you can also add 2 tsp asafoetida powder and then grind the powder.